Yesterday I watched my sons, ages 5 and 7, shovel the snow. They were so excited to get out there, shovel in hand, helping and making the way clear. As I stood and watched them, I was filled with love and thankfulness for my little men, growing up so big and strong, physically and spiritually. They weren’t perfect in their shoveling. But, they would try to improve their methods if a lift or push didn’t do what they wanted it to do. Of course the bigger boy got more done, but the younger did his best. I love them the same and didn’t compare them. It was a moment of love, not fear. And it made me think of God’s love for us. He looks at us in love. He is not wagging His finger in disgust, micromanaging our lives. He allows us to make mistakes. He forgives. He doesn’t compare us with each other. He gives us the “thumbs up” as we walk along the path of life with Him. When the boys saw me watching, smiling from the window (between stretches, lunges, and squats – gotta get exercise in sometime! ), they worked harder, happier, and pretty much “went to town,” clearing the entire driveway, sidewalk, and steps. Aches, pains, cold. After putting in several minutes of hard work, my boys came into our warm home, happy to find hot cocoa and a loving, thankful Mama. Someday, I am going to go home, too. 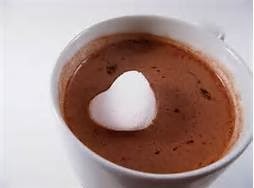 And I want to hear my Father say, “Well done, good and faithful servant.” Maybe He will even have hot cocoa for us to share together.